Having knocked back the dough you will be left with a ball of dough that has a very active yeast in it. All it needs to continue growing quickly is a warm, moist environment. But before it grows for this second time, we should shape it to achieve our desired final loaf shape. Large Tin Loaf with a good crust. First stretch your dough away from you in the same way as when you were kneading the loaf earlier, then fold one third of the dough over the centre third, and the remaining end over the first end. 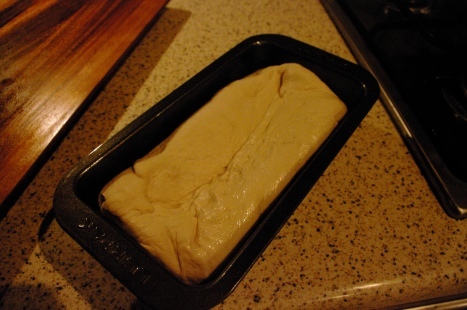 Roll it gently to squeeze together the edges, and place it in a lightly oiled loaf tin. Preferably with the joins down, unlike my example below. 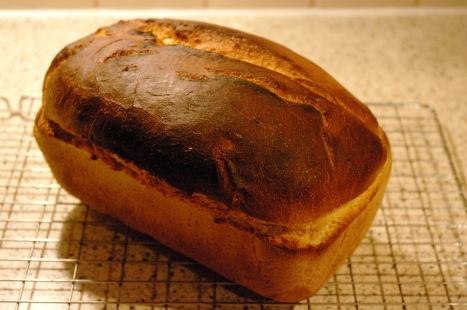 However, it does not really matter, all that will happen is that the loaf will burst the joint slightly as it cooks – you can see that this has happened when you look at the finished loaf above. Tastes great along the edge, and adds character. There are a number of other options for shaping a loaf that we will discuss later. At this point you are ready for the second proving.